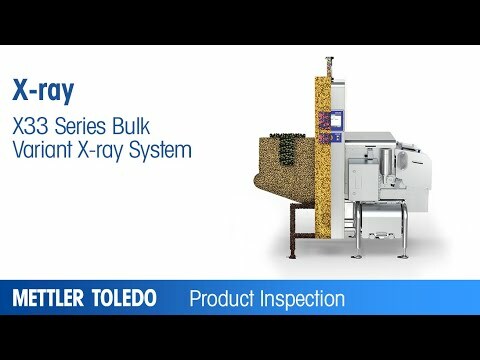 METTLER TOLEDO Safeline's x-ray inspection systems for bulk foods are designed to ensure quality assurance in a wide range of industries including meat, poultry, fish, seafood, fruit, vegetables, snacks and confectionery. Typical applications include the inspection of bulk-flow food products to ensure quality before they are packaged for distribution or added to other ingredients in further down line processing. 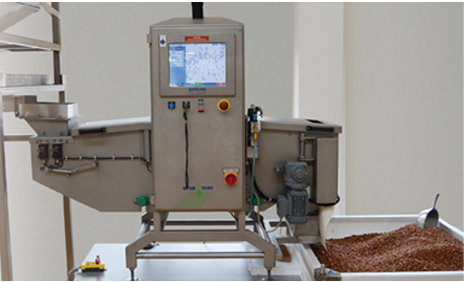 X-ray inspection systems for bulk foods are specifically designed for detecting physical contaminants such as glass, metal, mineral stone, high density plastic and calcified bone - regardless of their shape, size or location within the product. Contaminants are easier to detect in bulk-flow food than in final packaged products as they are typically inspected through a homogenous layer of product. This can mean the depth of the inspected bulk food product is much smaller than in a final closed-pack. 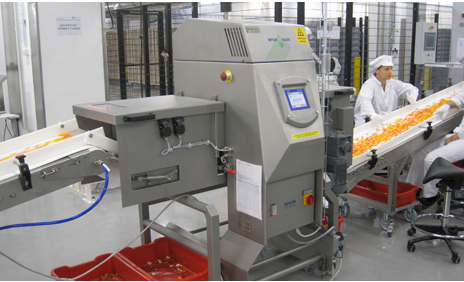 A homogenous layer of bulk food product is achieved due to the combination of a troughed belt and an adjustable levelling plate, maintaining a consistent depth of product, which is optimum when inspecting bulk foods. This providing outstanding detection sensitivity. High throughput capabilities mean our x-ray inspection systems can run at high line speeds, maintaining required productivity levels. Consideration should be given to the location of bulk x-ray equipment on the production line. When placed early in the process, systems can inspect incoming goods or raw materials enabling contaminants to be removed at source and quickly traced back to the supplier. It also means that physical contaminants are removed before further value is added to the product, saving costs. What bulkflow products can be inspected by METTLER TOLEDO Safeline's x-ray systems? Bulk-flow x-ray systems provide outstanding detection of physical contaminants in various applications including wet, dry, free-flowing loose products before they are packaged or added, as an ingredient, to a finished product. Typical applications include grains, nuts, extruded snacks, frozen or dried fruits, vegetables and pulses. What is the best way to feed product into a bulk food x-ray inspection system? Product presentation is very important with bulk-flow systems; this can be via an up-stream conveyor, hopper or vibratory conveyor feed. To guarantee consistent detection performance, it is desirable to have a consistent product depth passing through the x-ray system. What are the benefits of bulk x-ray inspection? When using bulk x-ray inspection technology, physical contamination detection levels are typically better in the early stages of the production process where unprocessed bulk product can be presented in a shallower depth and with a more uniform (homogeneous) texture than in final sealed packs. Incoming bulk raw materials in the food industry can chave a high risk of contamination. The inspection of these products as they enter the factory using x-ray technology allows the quality of the products provided by suppliers to be checked. Eliminating the risk of contaminants as early as possible in the production process will minimise product waste and production costs. Further value added to the product through food processing and packaging is avoided and processing equipment is protected from possible expensive damage caused by an undetected stone or piece of metal. What reject devices do you commonly use on your bulk systems? 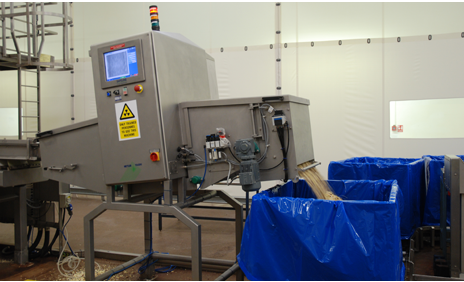 Multi-lane scoops are available to suit a wide range of bulk-flow products and throughput rates. Instead of rejecting a full belt width, multi-lane scoops allow a much smaller amount of bulk food product to be rejected; minimizing product waste, saving costs and improving productivity. What hygiene features are available on bulk x-ray inspection systems? Sloped surfaces and curved edges minimize bacteria traps and allow water to run off the system, enabling quick and effective cleaning with minimal downtime. IP69 rating comes as standard for all METTLER TOLEDO bulk x-ray solutions, making them suitable for harsh wash-down environments. How do you transport product through the bulk x-ray system? A troughed belt is recommended when inspecting bulk food products and a number of factors must be considered when choosing a suitable belt material. In bulk-flow applications where loose, free-flowing unpackaged product is in direct contact with the belt and/or side-skirted guides, the transport handling materials used must comply with FDA regulations and EU Directives. What throughput levels can be achieved? High volume throughputs up to 14,000 kilograms per hour can be achieved (depending on product density and layer thickness), meaning bulk systems can run at customers' existing line speeds, maintaining high production levels. Where on the production line is the ideal insertion point for a bulk x-ray inspection system? Using the Hazard Analysis and Critical Control Points (HACCP) process is the surest way to ensure products are free from contaminants. Manufacturers should perform a review of the production process and identify risks to product safety. Where a risk of physical contamination is identified, a Critical Control Point (CCP) should be established. In many cases, this can be early in the production process to identify and remove contaminants before adding value to the product. In other circumstances, it may be more practical to inspect at the end of the process prior to shipping of the product.